Kootenay National Park is a long, thin park with the highway running down the middle through a large valley and with mountains rising up on either side. The valley is made up of coniferous forest and it is very susceptible to forest fires. Following the highway up through the park, you pass through an old, forested area and then suddenly you pass into a huge burnt area full of dead trees from the highway right up to the treeline on the mountains on both sides. 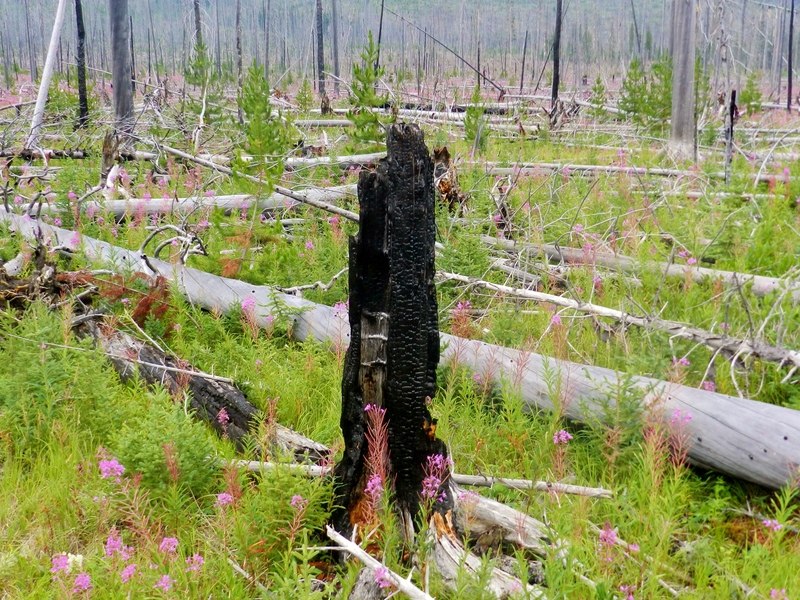 This is result of a huge forest fire that swept through in 2003 and we decided to set up one of our sites in this unique burn area. In the park there is also a small burn area from a fire last year and we’ve been told a small fire is burning in the park right now. Of all the parks we’ve visited Kootenay has been the most obviously impacted by fires. There is even a valley called Lightning Alley where thunderstorms occur very often and are known to spark fires. We have been lucky this whole trip to have had great neighbours at all the campgrounds and RV parks we’ve stayed at. Here at Kootenay has been no different! We’re staying at a cabin at the fire operations centre and in the cabin next door is a crew of four forest fire rangers from Quebec. They were very friendly and we were able to learn more about the management of forest fires from them. The most recent fire they had responded to was in Yoho National Park. 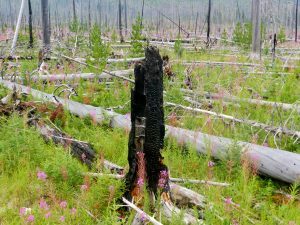 Most fires are left to burn but they are contained to prevent it from spreading, however in Yoho there was what they call “value at risk”. There was a road, a railroad and buildings nearby so in this case the fire needed to be put out. Thanks to the fire rangers, the fire did not cause any serious problems. While here in Kootenay we also had an awesome afternoon of outreach, talking to the public about what we do. 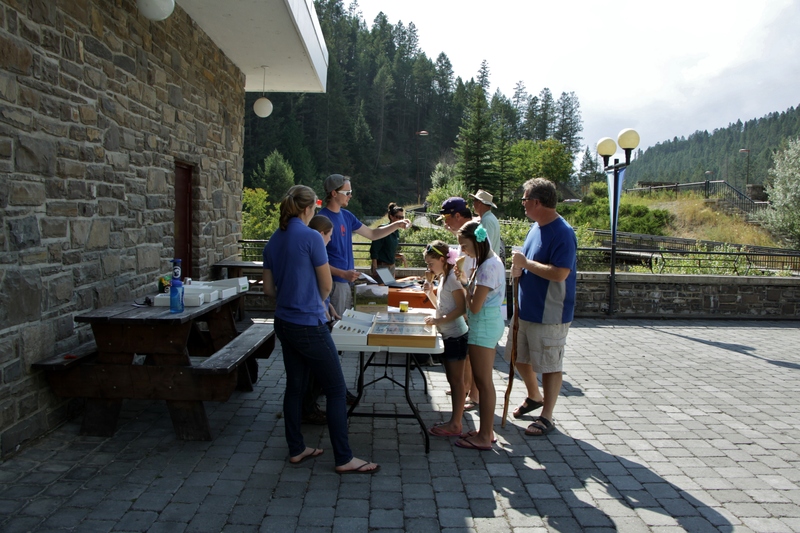 We set up at the Radium Hot Springs pools alongside Rachel, from Parks Canada, who was talking about wildlife monitoring programs in the park. Over the course of a few hours we had over 100 people come check out our displays! Lots of kids came by with stories about the biggest, craziest insects they’ve seen and stories about catching insects in their backyards. It’s great to see kids getting excited about insects. And, of course, they love the insect buttons and bookmarks we give out! After spending the afternoon talking to the public at the Hot Springs, we couldn’t resist checking out the hot springs for ourselves and going for a quick swim. At 102°F it was really hot! And relaxing after a day of work. And now one of our coolest insect finds here in Kootenay…At our seasonal wetland site, I came across a bunch of really cool caterpillars. There were about six caterpillars feeding on a small plant surrounded by piles of frass (caterpillar poo). When I grabbed one with my forceps to collect him, he shot out two long orange projections from his head and suddenly it smelt really bad. A few seconds later these orange ‘horns’ were retracted and he looked like he did when I found him. The ‘horns’ are known as an osmeterium and it is also responsible for the bad odour to deter predators. It was an awesome defensive display to see! 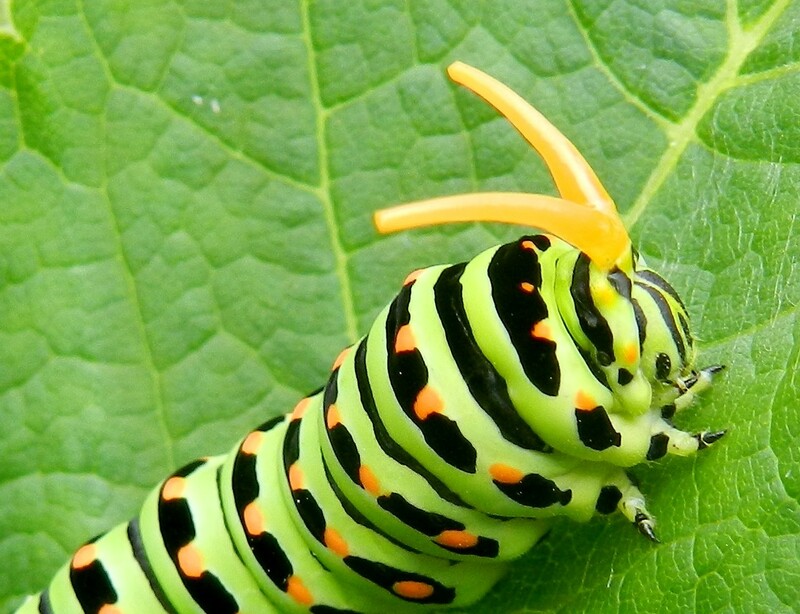 After consulting the textbook we have with us, my best guess is that this caterpillar belongs in the Swallowtail family of butterflies (Papilionidae). This guy was definitely one of my favourite finds from this park! I’m looking forward to more cool insects at our last park, Darkwoods, a Nature Conservancy property. It is I, your humble BIObuser, Martin, come to enthral and enlighten you of our glorious trip to British Columbia. So to continue our conversation about stars last week, this week I took the most amaz-… wait, you don’t want to hear about stars again do you? No I didn’t think so. Really, two blogs in a row about stars? I must have been daft! But to be fair they were pretty cool photos and I was pretty excited about it in Glacier… I didn’t even talk that much about Glacier… surely my co-BIObusers talked about it. Anyways, this week we are in Kootenay National Park and I took the best star… got you! Ok, for real this time. This week on our BIObus adventure in British Columbia we stayed in Kootenay National Park. It’s definitely has some history to it and I’m pretty sure my fellow BIObusers will enlighten you on some of these topics but I’ll write about something I had not even known existed until I stepped foot on a trail path. We planned to head down a trail called Paint Pots to collect insects along the trail. I had no idea why the trail was called Paint Pots and I was pleasantly surprised. 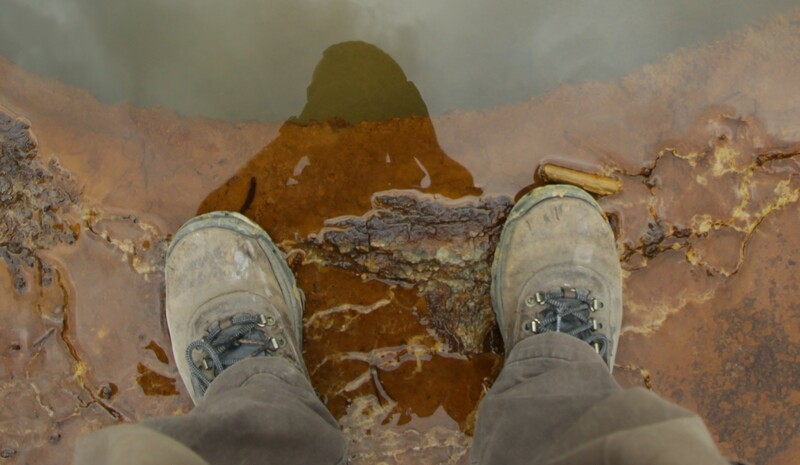 The trail wound through ochre beds, ochre is essentially iron rich mud and is a deep orange colour. The iron comes from cold mineral springs in a mountain but before it reaches the ochre beds it first passes through the Paint Pots. I wasn’t really sure what I expected the Paint Pots to be but I was very intrigued by them. As I said, the water that comes from the mineral spring is heavily laced with iron and so as the water pools in certain areas the iron molecules react with oxygen to make iron oxide, or, rust. 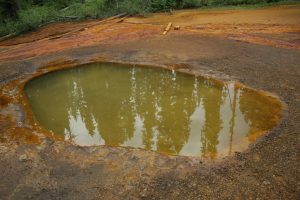 Eventually the iron oxide builds up around these pools making the Paint Pots deeper, all the while more water is depositing more iron oxide on the edge of the pool. The Native Ktunaxa tribes used to use the ochre as a red paint base; the ochre was dug by hand, rolled in to small patties and baked. The baked patties were made in to powder and used as red paint to paint their skins, leather, tipis, or to paint pictures on rocks. At the start of the 20th century the ochre was recognised as being commercially profitable. 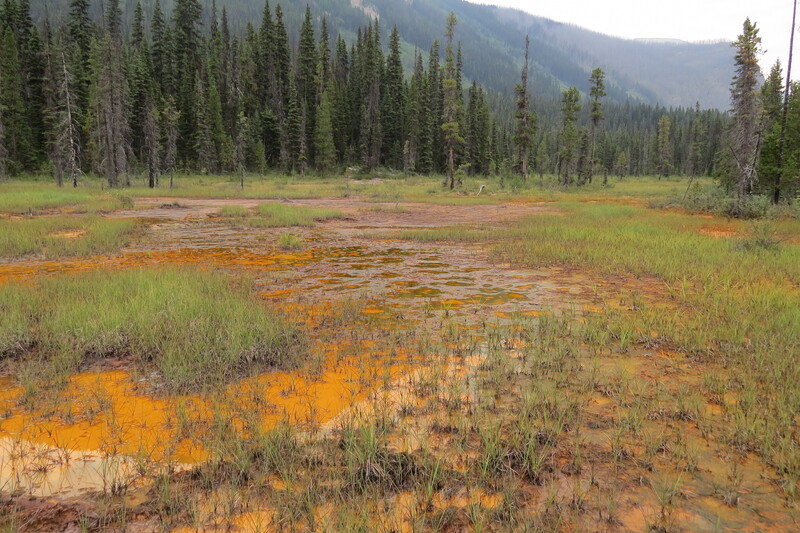 The ochre was hand dug and carted by horse to the Canadian Pacific Railway line near Castle Mountain 24 kilometers away, the ochre was then sent to Calgary. In Calgary ochre was processed and the red pigment of the ochre was used as a pigment in paint. When the National Park took over the land some mineral claims still existed but were eventually phased out as being incompatible with the aims of the park.